When this picture came through little did I realize what an interesting aircraft G-CONV was and what a life she had led prior to ending her days in a Scottish Nursery. See, that’s the great thing about ballooning and unplanned landings which means you end up going through the back end of nowhere where the bizarre and unexpected lurk. Very interesting Mr Chadwick. So there they were, whizzing down the road following a very pleasant morning flight, when in a garden just over a hedge appeared an airliner in the middle of nowhere, part of a nursery. What to do? Well, go and buy some pot plants obviously. Given the lead by that Sherlock Holmes of the Old & Rusty aeroplane world, Mark Stelling, avid plane buff Ian Chadwick had to go and have a gander and snapped a couple of piccies. 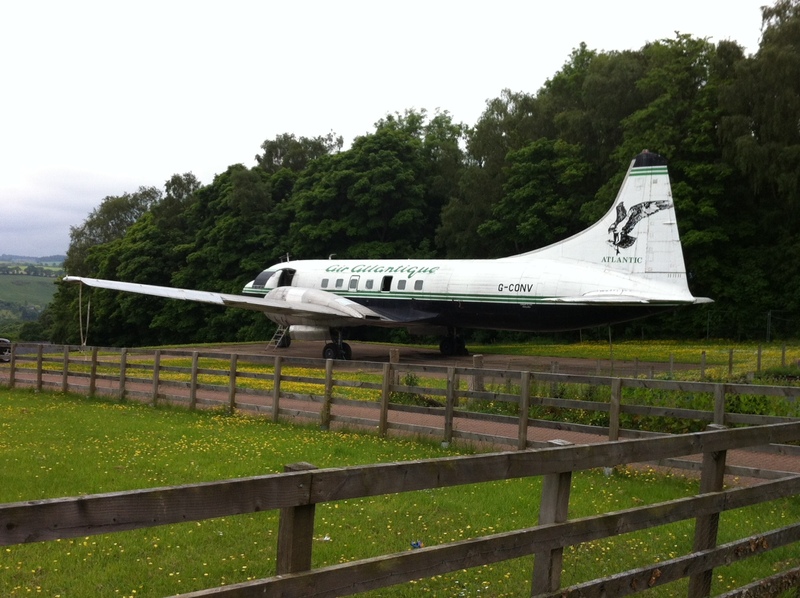 How did something as iconic as a Convair 440 end up in a Commercial Plant Nursery in Scotland. Well…. What Stumpy the Pilot had spotted, literally, was a Convair 440 Metropolitan tucked away in the back garden of the Reynard Plant Nursery in Carluke, South Lanarkshire. According to BBC Scotland the aircraft was bought by Andrew and Tricia Scott for £10,000 as a bit of a gimmick to promote the nursery. Purchased in 2006, it was planned to convert the airliner firstly into a restaurant but then, thinking outside the box, into a luxurious B&B but that seems to have not occurred. Today the Convair sits engine-less and with no future. Bit sad really. All the pics here are of the same aircraft in her various liveries. Amazing. 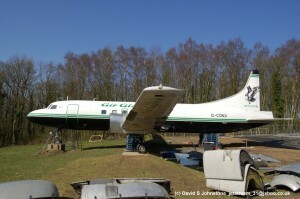 Turns out that this is, or was, G-CONV and last owned by Air Atlantique based at Coventry Airport. It is rumoured that it cost the Scott’s £20,000 to shift it from Coventry by road. When Air Atlantique originally purchased it plans were to include it as part of their successful Cargo Fleet but following a less than successful approval flight with the CAA on board when the port engine caught fire it went on static display at Coventry. The engines were removed and it was eventually sold to the Scotts who launched the idea of a £400 a night Fantasy Flights, very up market, B&B (the most expensive in the UK) commissioning a Gary Doy (part of the Jaguar S-Type and XK8 design team) of Design Q to design the interior. Due to open in 2008 nothing happened and it now sits engineless and somewhat unloved in their garden. Back in April 2008 Mr Scott was quoted as saying "It wasn't my idea, it was the wife and what a woman wants, a woman gets. We originally went to look at a fighter plane, but this larger plane was behind.” He went on to explain that the airline theme would run through the guest's entire stay. “They will be given a boarding pass on arrival, the option of wearing a flight attendant or pilot's uniform, and will be able to operate controls within the aircraft such as the seatbelt signs and the in-flight tannoy”, adding, "There will be a manual inside the plane so anyone who is a keen aircraft enthusiast can go through all the checks. We envisage a bit of fun here." 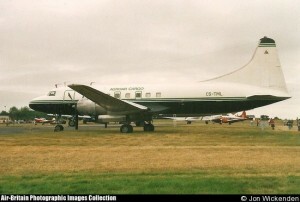 G-CONV was the last commercial airworthy Convair 440 in Europe. According to its records it was built in 1957 with Construction number 484 and appeared as CS-TML, N357SA, N28KA, N28KE and N4402. 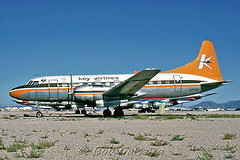 With construction number 484 it was delivered new to Mohawk Airlines in July 1959 as a Convair CV-440 and registered N4402. 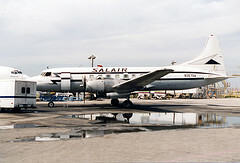 It remained in service with Mohawk until June 1971 when it was sold to Executive Airlines but in December it was repossessed by the First National Bank of Boston. History is all at odds because other sources report it was sold to Wright Air Lines in March 1971 and by 1976 it was registered to Key Airlines as N28KA. Who knows? For some reason whilst still with Key Airlines it was re-registered as N28KE in 1984. More shuffling followed and Basler Flight Service Inc bought it in June 1986 only hanging on to it for a year or so, when it seems to have been leased or used by Air Alaska Cargo, before selling it to Salair who registered it N357SA in May '88. You still with us as I’m not sure I am? In November 1995 Omni Air Group bought it and flew her to Europe, well Switzerland actually, as CS-TML then registered to Portugese owned Agroar Trabalhoa Aereos in May 1997. Somewhere along the way it appeared as a static exhibit at the "50 years Airport Zurich" event. Atlantique Airlines of Coventry then stepped in and acquired it around October 1999 but it didn’t get registered and it flew into Coventry still as CS-TML where Jon Wickenden managed to get this picture shortly after its arrival. It was eventually, very fittingly, re-registered G-CONV in April 2001 and the future looked bright. A flight test took place to get a Certificate of Airworthiness but damage to the hydraulic system following a fire in the port engine meant it failed and any idea of restoration was shelved. Cutting their losses Air Atlantique took the decision to sell the airframe and off it went to Scotland. The Convair 440 started life in 1946 as the Convair 110 and was originally designed to replace, or rather, compete with, the hugely successful DC3. Fitted with Pratt & Whitney radials, as was G-CONV, by 1954, in an attempt to compete with turboprop-powered airliners like the Vickers Viscount, it evolved into the pressurised 440 Metropolitan featuring more streamlined cowlings and new engine exhausts complemented by improved soundproofing for the cabin but already the development of piston engined aircraft had reached its climax and the next generation of Convairs were fitted with turboprops along with some others being converted to the new engines. A few of the Convairs are still in service today, mainly turbo-prop versions. Unravelling the story of G-CONV certainly shows she led a very varied, colourful and eventful life, mostly in the States. In her day she was amongst the leading American airliners serving on mostly internal routes occasionally travelling down to the South Americas and then later as a cargo carrier. Although she will never fly again quite what her fate will be is uncertain. Hopefully the Scott’s original idea will come to fruition and she’ll have a new life as a luxury B&B but for the moment she is a piece of aviation history sitting in a back garden. 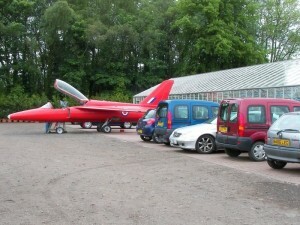 If you wander round the car park at the Nursery you will also find a Folland Gnat T1. This was originally XM697 and later entered private ownership as G-NAAT appearing unexpectedly at many airshows flown enthusiastically by the late John Hallett. Despite now being painted up as a Red Arrow it had a much more interesting life being a pre-production T.1, first flown on 16th March 1961. It spent most of its life with the A&AEE at Boscombe Down for trials work before finally retiring as a chase aircraft for Hawker based at Dunsfold in 1968. She ended up in the care of the Woking ATC squadron before being sold to John Hallett. After a stint in Bournemouth Aviation Museum and a time in Devon she finally ended up in Carluke in 2006. For the flyers amongst you I am very reliably informed that you can see the Nursery and the Convair when departing from Edinburgh Airport on Runway 24 turning left. At least it can watch the planes go over. Nice.